I'm training my library eyes to look in a different way. To ignore the bright and shining new covers and seek out older, shabbier and well-read titles from the 20th century that will help me fill the gaps in the Century of Books project. This was one of my finds and I can only hope there will be many more as good as this proved to be. Grandma has rapidly progressing senile dementia. The once tough, witty and self-reliant woman has had to be moved from her home in Glasgow to be nearer her family. She has always put her menfolk first, always been the carer, but now must let them care for her. Martin who thinks she should have put straight into a Home and refuses to have anything to do with her care. Nor will he allow his children to visit in case they are frightened. Bridget who was the least favoured child now lavishes love on her mother with the certainty that she will get better. She is single, a nurse working shifts and a lover - Bridget is not always there when needed. Charlie pays the bills but tries to stay emotionally detached and seems unable to make decisions as to Grandma's future. The story is narrated alternately by Charlie's wife, Jenny, and his daughter, Hannah. Jenny has never got on with her mother-in-law but it is on her shoulders that most of the care-giving falls. She becomes increasingly tired and worried as she struggles to look after her home and family while being on constant call to aid Grandma. Jenny is the only one who is willing to confront the reality of Grandma's future and to take steps to towards what needs to be done. Hannah is seventeen - beneath the cheek she gives her Grandma and the disgust she feels at her lack of table manners and her embarrassing incontinence lies a compassionate heart and she is always willing to lend a hand. She is also very observant and constantly questions what is happening around her. "I think if Bridget brings Grandma out (of hospital) and gives up her own job, goes onto Social Security to look after her, then she is mad. The question is: is it better to be mad or is it better to be sane and cruel?" I do think this is a book that will be most appreciated by anyone whose life has been touched by the loss of a loved one to dementia. It's brilliance lies in this being a very ordinary family and so very easy to relate to on an emotional level. The different attitudes of the characters are recognisable, as are the small, day to day happenings that create such frustration and despair. If all this sounds a bit depressing, it's not! 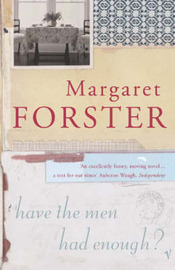 Margaret Forster writes with insight about one of life's sad and painful experiences but she does it with a great deal of humour and I laughed a lot. This does sound touching. My favourite is Still Alice on similar topic. Great that you are trying others, not the new and so far you are getting great reads. I think the other brother is called Stuart in my copy not Martin.